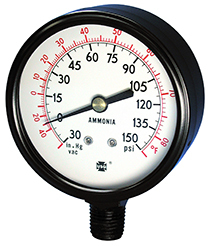 Designed for installation in ammonia refrigeration systems, the Model 1706 ammonia, steel case pressure gauges are available in 2-1/2" and 3-1/2" gauge sizes. These 1706 compound gauges can also be used in environments with other chemicals not injurious to wetted parts. A silicone-dampened movement greatly extends the life of the pressure gauge, and is particularly effective in punishing applications like ammonia compressors.